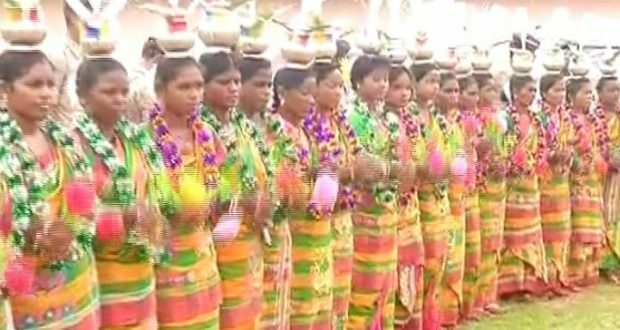 Bhubaneswar:9/8/18: A huge congregation of tribals gathered at the Adivasi exhibition ground in Bhubaneswar today to take part in the ‘World Adivasi Day’ celebrations observed by the Biju Janata Dal(BJD). Addressing the crowd, Chief Minister Naveen Patnaik said that the BJD-led State government is working towards welfare of the adivasis. “I am delighted to meet the members of the adivasi community today in Bhubaneswar. Our party is working for the development of adivasis and will continue to do so,” Patnaik said. “The newly constructed Gurupriya bridge in Malkangiri has been dedicated to the adivasis and will usher development in the tribal area,” he said.